Well, our editor is back from New Orleans and he won’t shut up about what a great time he had — except for one thing: The Big Easy doesn’t live up to its name for cyclists. 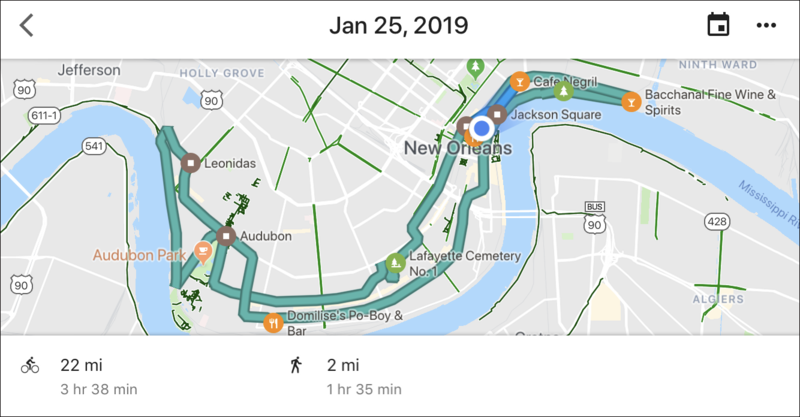 The Crescent City could be a paradise — it’s almost entirely flat and the weather cooperates almost the entire year — but there’s a dearth of protected bike lanes, gas is $1.89 a gallon, and drivers speed around like they own the place (which, alas, they do). On the plus side, the Blue Bike system — a dockless bike share run by Social Bicycles (aka Jump) — is pretty good. We were pleased to see the Post write an editorial based on David Meyer’s Streetsblog scoop that Gov. Cuomo’s plan to swipe half of the money from the speed camera expansion for the MTA. Also in the Post, Mary Huhn channeled her inner Streetsblog when she condemned how rarely killer drivers get jail time, thanks to lax DAs and incomplete investigations by the NYPD. Fair Fares is a joke, argues Josmar Trujillo in an amNY op-ed. The city provides basic services such as sanitation and fire protection to its taxpayers — so why not transportation? The Times offers a deep dive on subway pickpockets. Oslo has banned cars from a big portion of its center city, Fast Company reports, and we bring it up here only as a reminder that Mayor de Blasio will not even consider doing that even in a tiny part of Manhattan. Has anyone noticed that very-ex-State Senator Marty Golden is still tweeting as @senmartygolden? For the record: Marty Golden is no longer a state senator, having lost in November to Andrew Gounardes. The Dutch invest €595 million—or €35 per resident—annually on cycling (15 times that of nearby England). Seem expensive? The more heavily subsidized the local transit is, the worse it gets. It is one of those behavioral economic flukes where consumers (citizens) satisfaction has less direct impact on quality. The bike path on the lower left looks like something straight out of Avatar. The one on the upper right is really interesting. Reminds me of the express run from 59th to 125th on the D where you see tracks changing elevation. I guess they get to keep the title forever, kind of like “President”. Having ridden buses in the Capital District, following my NYC tax dollars there, and in NYC, I have to disagree. While the headways are long Upstate, the buses move fast, are on time, and less crowded than they are here — not to mention half the price. Although I get the feeling I’m the only non-poor person on the bus up there, riders are treated with more dignity there than they are here. The word “sen” in Esperanto means “without”. So we can rejoice that we are “sen Marty Golden”. Honest question–why do signals need to be replaced on the one line that has modern CBTC ? Unfortunately, I suppose, all the wayside equipment was damaged by the flood. My guess is that everything inside that tunnel was (relatively) new and being replaced for the second time in recent years. My understanding was that the CBTC equipment was easily removed before Sandy (and reinstalled afterward, which got the line back up so quickly).